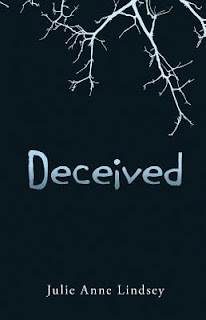 I think what I liked best about Deceived was that Elle was a refreshing heroine. Sure, she's crushing on a cute guy, trying to fit in at a new school, and full of teen angst but what I liked best about her was that she was your typical teen. She actually has a group of friends, doesn't drop them for the guy, and has a parent who isn't there a lot, but isn't completely uninvolved either. I also really enjoyed how when strange things happen to her she's freaked out by them-yet does her best to figure out what in the heck is going on. There is a romance, but I think that just ads to the mystery instead of taking away from it like it does in so many books. Deceived was just a refreshing read that once I sat down and was able to read it uninterrupted had it done in one sitting. If you are looking for a Young Adult read that's a bit different, I really recommend this one.